14.01.2018 Elsie Loukiantchenko wins best talk at the Canadian Conference for Undergraduate Women in Physics held at Queen's Univiersity in Kingston. 23.10.2017 Gurkaran Chowdhry wins second place for his talk in the Quantum & Solid State Physics section at the Canadian Undergraduate Physics Conference held at Carleton University. 10.10.2017 Clémentine Fournier and Carmen Lee win awards for their talks at the department's graduate student symposium day. 03.10.2017 Jean-Christophe Ono-dit-Biot successfully defends his MSc thesis. 15.09.2017 Benjamin Davis-Purcell successfully defends his MSc thesis. 01.06.2017 Jean-Christophe Ono-dit-Biot wins first prize at the CAP Congress for his talk "Rearrangement of 2D clusters of droplets under compression: transition from crystal to glass"
31.05.2017 Most of the research group at the CAP Congress in Kingston, ON. 15.03.2017 Most of the group at the APS March Meeting. Talks ranging from capillary levelling to elastocapillarity to fingerring instabilities. 12.12.2016 Jean-Christophe Ono-dit-Biot wins second prize for his poster and John Niven wins third prize for his talk at PolyMac 2016. 11.11.2016 Benjamin Davis-Purcell wins first place for his poster at the Nano Ontario Conference 2016. 16.10.2016 Kathleen Charlesworth wins second place for her talk in the Biophysics/Soft Matter section at the Canadian Undergraduate Physics Conference held at Dalhousie University. 11.10.2016 Jean-Christophe Ono-dit-Biot and John Niven win awards for their talks at the department's graduate student symposium day. 04.08.2016 Adam Fortais successfully defends his MSc thesis. 17.03.2016 Group trip to APS March Meeting with fabulous presentations by Adam, Rafael, Paul, and two by Mark, including one in the Padden Awards session!!! 04.12.2015 Mark Ilton successfully defends his PhD thesis!!! 26.10.2015 Christian DiMaria and Katelyn Dixon win first and third place for their talks in the Biophysics/Soft Matter section at the Canadian Undergraduate Physics Conference held at Trent University. 27.07.2015 Matilda Backholm successfully defends her PhD thesis!!! 03.11.2014 Our work on swimming near boundaries “Undulatory microswimming near solid boundaries”, Rafael Schulman, Matilda Backholm, William Ryu, and KDV, Phys. Fluids 26, 101902 (2014), highlighted in Physics Today, Physics update “Watching nematodes swim the channel” by Ashley G. Smart. 26.10.2014 Claire Preston and Miles Couchman win first and third place for their talks in the Biophysics/Soft Matter section at the Canadian Undergraduate Physics Conference held in Kingston. 19.09.2014 Robert Peters successfully defends his PhD thesis! 12.09.2014 Rafael Schulman successfully defends his MSc thesis! 03.09.2014 Paul Fowler successfully defends his MSc thesis! 03.09.2014 Solomon Barkley wins award for his talk at the department's graduate student symposium day. 20.10.2013 Sean Ridout wins second place for his talk in the Biophysics/Soft Matter section at the Canadian Undergraduate Physics Conference held in Hamilton. 06.09.2013 Kari Dalnoki-Veress recipient of the President's Award for Excellence in Graduate Supervision in Science. 03.09.2013 Rafael Schulman and Paul Fowler win awards for their talks at the department's graduate student symposium day. 02.04.2013 Josh McGraw wins an NSERC Post-doctoral Fellowship which will help to fund his work in Prof. Karin Jacob’s research group in Saarbrücken. 13.03.2013 Oliver Bäumchen wins 2nd prize for his poster in the Chemical and Polymer Physics Division of the DPG (German Physical Society) Spring Meeting entitled Capillary Levelling of Stepped Polymer Films - A Nanofluidic Probe of the Slip Boundary Condition by Oliver Bäumchen, Thomas Salez, Joshua D. McGraw, Michael Benzaquen, Paul Fowler, Elie Raphaël, and Kari Dalnoki-Veress. 12.12.2012 Josh McGraw successfully defends his PhD thesis! 02.12.2012 Josh McGraw is selected to take part in the Padden Award Symposium in the Division of Polymer Physics at the 2013 APS March meeting in Baltimore. 28.10.2012 Richard Parg wins first place for his talk in the Condensed Matter section at the Canadian Undergraduate Physics Conference held in Vancouver. 04.09.2012 Matilda Backholm and Mark Ilton get first place in a three-way tie for their talks at the department's graduate student symposium day. 02.08.2012 Sara Cormier successfully defends her MSc thesis! 04.07.2012 Physics Today prints article “Canada’s researchers fret over shifts in funding landscape” which quotes Kari Dalnoki-Veress and friends critical of recent NSERC funding decisions. The same article also showcases an image taken by Matilda Backholm of her c. elegans experiment as an example of curiosity driven research. 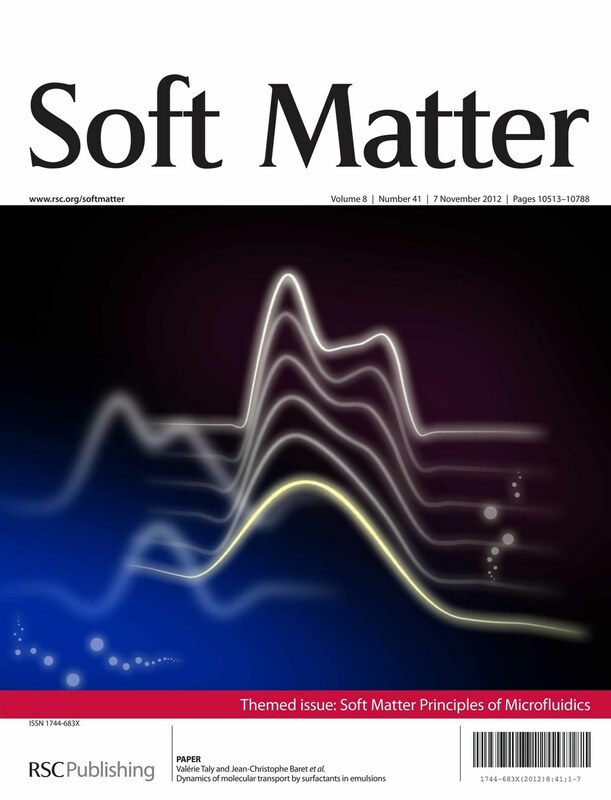 03.01.2012: Josh McGraw’s paper entitled "Dynamics of interacting edge defects in copolymer lamellae", appears on the cover of EPJE. 19.10.2011: Kari Dalnoki-Veress elected Fellow of the American Physical Society. 16.10.2011: Paul Fowler wins second prize in the ‘Condensed Matter and Materials Physics’ section for his presentation at the Canadian Undergraduate Physics Conference held in Saskatoon. 06.09.2011: Sara Cormier wins first place for her talk at the department's graduate student symposium day. 05.08.2011: Mark Healey defends his MSc thesis! 13.07.2011: Josh McGraw, with a talk entitled Capillary levelling and crazing for thin polymer films, is one of twelve participants selected to take part in the "master classes" at the SoMaS School 2011 in Mittelwihr, France. 03.12.2010: Jessica Carvalho defends her PhD thesis! 24.08.2010: Robert Peters defends his MSc thesis! 15.01.2010: Marie-Josee Colbert defends her PhD thesis! 08.12.2009: Josh McGraw wins second prize for his talk at the annual McMaster Polymer Science conference Polymac 2009. 08.12.2009: Congratulations to Jessica Carvalho who is selected to take part in the Padden Award Symposium in the Division of Polymer Physics at the 2010 APS March meeting in Portland, Oregon. 11.2009: Veeco selects Ian Rowe and Josh McGraw’s Atomic Force Microscope image for publication in their 2010 calender. The image was taken with the Veeco Caliber. 08.09.2009: Rob Peters wins first prize for his talk at the department's graduate student symposium day. 26.02.2009: A huge day! Both Andrew Croll and Adam Raegen defend their PhD thesis. Andrew is off to do a PD with Al Crosby at UMAss and Adam will go to work with Guenter Reiter at Freiburg. 10.09.2008: Marc-Antoni Goulet defended his MSc thesis. 12.08.2008: Joshua D. McGraw defends his MSc thesis. 10.09.2008: Joseph Parete defends his MSc thesis. 12.06.2008: Andrew Croll received the first prize in the Best Student Presentation competition in the Division of Condensed Matter and Materials Physics and second place overall at the Canadian Association of Physicists Congress in Quebec City, 2008. 12.06.2008: Marc-Antoni Goulet received the first prize in the Best Student Presentation competition in the Division of Medical and Biological Physics and third place overall at the Canadian Association of Physicists Congress in Quebec City, 2008. 29.10.2007: Michael Massa, Ph.D. 2006, has been awarded the 2006-2007 Governor General's Academic Medal. The Governor General's Academic Medal is awarded to the graduate student who achieves the highest academic standing in his/her graduate degree program. 22.10.2007: Sara Cormier and Rob Welch were awarded third and first place respectively for their talks at the 43rd annual Canadian Undergraduate Physics Conference. Sara won for her talk "Ellipsometry investigations of a morphological transition in thin diblock copolymer films" and Rob Welch won for his talk entitled "Plateau-Rayleigh instability as a probe for the mechanical properties of confined thin polymer films". 03.10.2007: Kari Dalnoki-Veress has been awarded the 2008 John H. Dillon Medal of the American Physical Society "For significant and innovative experiments in glass formation and polymer crystallization at the nanoscale." 04.09.2007: Marc-Antoni Goulet wins first prize for his talk at the department's graduate student symposium day. 06.06.2007: Matt Farrar received the Governor General's Academic Silver Medal given to the undergraduate who achieves the highest academic standing upon graduation from a bachelor degree program. 17.11.2006: Andrew Croll’s paper on the "Droplet Shape of an Anisotropic Liquid", Phys. Rev. Lett. 97, 204502 (2006), appears on the cover. 24.10.2006: Matt Farrar won first prize for his talk at the Canadian Undergraduate Physics Conference. 02.10.2006: Mike Massa defends his PhD thesis. 28.07.2006: Jessica Carvalho defends her MSc thesis. 04.11.2005: Mike Massa’s work on crystal nucleation which was published in Phys. Rev. Lett. (92, 255509; 2004) is featured in the “Journal Club” section of Nature (Vol 438, 3 November 2005) by Anthony Ryan. 06.09.2005: Jessica Carvalho wins first prize for her talk at the department's graduate student symposium day. 18.07.2005: Marie-Josee Colbert defends her MSc thesis. 25.02.2005: Andrea Colis defends her MSc thesis. 18.08.2004: Adam Raegen defends his MSc thesis. 18.08.2004: John Hudson defends his MSc thesis. 11.12.2003: Lun Si defends his MSc thesis. 02.09.2003: Andrew Croll wins first prize for his talk at the department's graduate student symposium day. 08.2002: Kari Dalnoki-Veress receives the Premier’s Research Excellence Award. 30.07.2002: Mike Massa defends his MSc thesis.